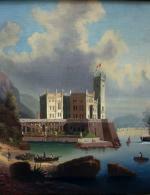 View of Habsburg Castle Miramare and town Triest on the background was executed by famous and high listed Austrian landscape and cityscape painter J.Wilhelm Jankowski (1825 Bohemia - 1870 Austria). Miramare Castle (Italian: Castello di Miramare; German: Schloss Miramar; Slovene: Grad Miramar) is a 19th-century castle on the Gulf of Trieste near Trieste, northeastern Italy. It was built from 1856 to 1860 for Austrian and later on by Emperor Maximilian I and Empress Carlota of Mexico, based on a design by Carl Junker. 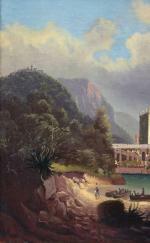 The author J.Wilhelm Jankowski recieved his popularity with views of different European cities and landscapes in the middle of 19th century, for exemple views of Salzburg, Vienna, Traunsee, Rome, Sevilla, Melk, Venice, Gmunden, Heidelberg , Amsterdam and others. As it´s known from artist´s other cityscapes, along with the known city views, the artist created his views of cities in free " capriccio" style, from memory, often changing the real architecture and using different pseudonyms. "Our" work signed by this artist with one of his pseudonyms. Inscription: signed indistinctly lower right. Technique: oil on canvas. Luxuriousy original period frame. Measurements: unframed w 39 1/3" x h 29 1/8" (100 x 74 cm), framed w 46 1/2" x 36 1/4" (118 x 92 cm). Condition: in good condition, canvas professionally relined.